Milkshake Conditioning W hipped Cream – Part of my spa at home reviews. 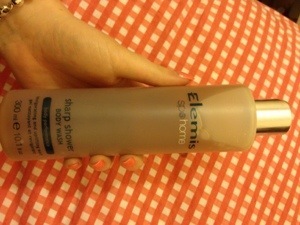 What we say: Leanne and I both tried out this product along with my sister who often steals things from my room. We like it, it leaves hair feeling and looking good. Milkshake Whipping Cream Detangles hair in an instant and leaves a salon shiny finish. I am sure my hair also took less time to dry when using. It smells good enough to eat and according to my sister and Yvonne it doesn’t taste all that bad, not exactly good but not awful (eating is not recommended). It is the perfect quick treat for hair, providing great results for a night out. The only thing we would say is be carful not to apply too much or you will need to wash hair again. You can buy the product Here it retails for £14.79 for a more than generous size. 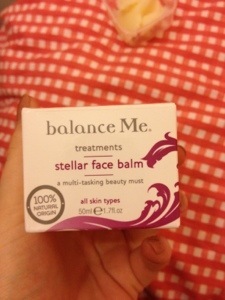 Balance Me Beauty Stellar Face Balm – Part of my spa at home reviews. this multi tasking product can be used for a whole range of things – lip balm, cuticle cream, dry patches, hair taimer, on impending coldsores, insect bites, face mask, sports protection, overnight treatment. Ingredients include: organic shea butter, virgin coconut oil, rosehip oil and mango seed butter, neroli, may chang and red mandarin which work together to smooth, softer and shield skin. I have a confession – I used this little beauty as soon as it arrived and decided at the moment there was no way it was leaving my possession for the other girls to try. I did share and let others test but only my mum and sister under my strict supervision. I can’t say enough good things about this hero product. My favourite is an indulgent over night face treatment, it absorbs much quicker than expected and you wake up with super soft and hydrated skin that feels healthy and glowing. My mum and sister agreed and loved the results. 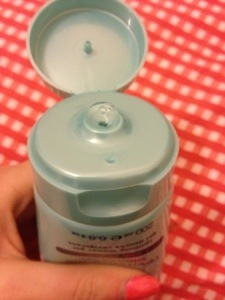 It’s great on dry lips and handy for rubbing on blisters to stop the sting or friction from shoes. It smells zesty and up-lifting. I can see myself buying this time and time again, although it seems to be lasting well so perhaps I won’t have to. If you need a new hero in you life then get ordering. 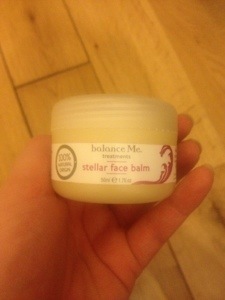 This cold weather is a perfect excuse to treat your skin with the TLC of Balance Me Beauty Stellar Face Balm. 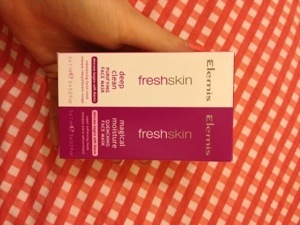 Elemis Freshskin face mask duo – Part of my spa at home reviews. What they say:Deep Clean Purifying Face Mask is ideal for rebalancing skin. The blend of goji berry extract, francincense oil and natural clays work to draw out impurities resulting in refined, softened and soothed skin. Magical Moisture Quenching Face Mask: leaves skin feeling soft and full of moisture. The white lupin, artic cranberry seed oil and apple extract leaves skin looking radiant and soothed. What we say: We love the super girly packaging in classic pink/purple and white. I used the magical moisture mask and really liked the results, I liked the creamy texture of the mask and my skin was left feeling soft and hydrated. The other girls have the masks the thumbs up and think the individual sachets are perfect for a girls night in. 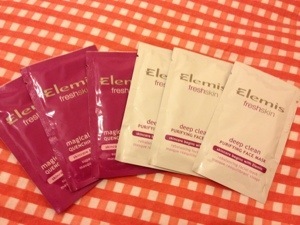 The face masks come in a pack of six sachets, 3 magical moisture and 3 deep clean purifying. 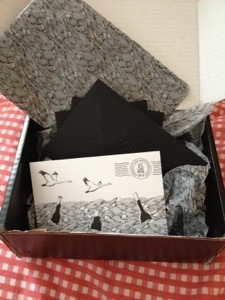 They cost £15.00 and can be purchased here. 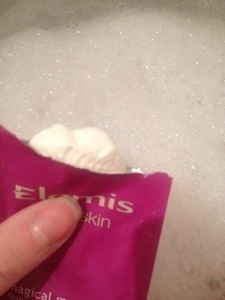 Elemis Shower Gels – Part of my spa at home reviews. 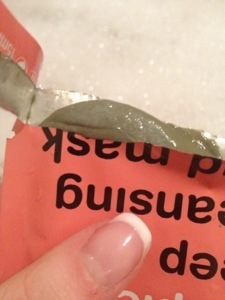 What they say: Revitalise – me shower gel: this uplifting shower gel will awaken your body and senses. With ingredients to cleanse, condition and care for your skin. A great way to start the day. Sharp Shower Gel: Part of the performance range this shower gel works to stimulate body and mind, suitable for women and men and is scented with peppermint, spearmint and nettle. What we say: If mint scents are your thing then you will love the Sharp shower gel. In all honesty we didn’t think the shower gels were anything to write home about. Yes the have a nice scent (quite masculine smelling) and they leave you feeling super squeaky clean but they wouldn’t be placed in our above average category. If I am spending around £20 a shower gel then I want luxury. In fact a don’t think I would have a budget this big for shower gel, bath oil yes, shower gel no. 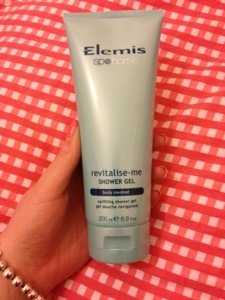 I did like the revitalise me gel when I covered my self in it and then submerged my body in a nice hot bath. Perhaps I just prefer bath products to shower ones. 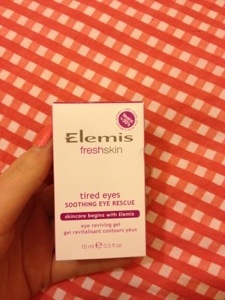 Elemis Freshskin Tired Eyes Soothing Eye Rescue- Part of my spa at home reviews. 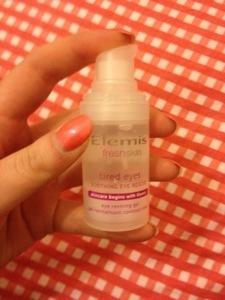 What they say: Refreshes, hydrates and reduces puffiness around the delecate eye area. What we say: we all agreed that this was cooling and soothing to the eye area but couldn’t decide if it was due to it being cold and wet or due to its ingredients. I use the product more than the others and I have to say it was great for weakening up my eyes during the day when using the computer and first thing in the morning. It does refresh and give a wide awake feeling. I can’t confirm the reducing of puffiness claim and will update if this changes with continued use. What they say: The hand therapy ingredients work together to sooth and moisturise hands as well as conditioning cuticles and nails. ingredients include Shea butter and Myrrh extract. Formulated without parabens, lauryl sulfates, mineral oil, and propylene glycol. What we say: A couple of us are long term fans of Crabtree and Evelyn products and this was the perfect opportunity to rediscover exactly why. 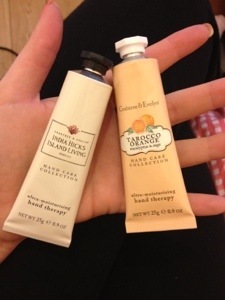 The hand therapy creams are trustworthy in delivering results. Soft subtle hands in no time, softening cuticles and moisturising skin. My favourite was the new edition to the brand Tarocco Orange, eucalyptus and sage, the other girls found this one a little sweet smelling and preferred the exotic scent of India Hicks Spider Lily. What we say: One of the girls, Yvonne, was super excited to review this product, having previously used samples from her Glossybox she had more than enough good things to say about it: “It tightens, it firms and your skin glows” were her claims. 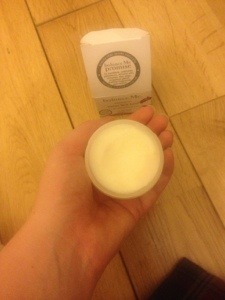 I used the cream morning and evening for 3 days and it did indeed provide an instant tightening and smoothing feeling. 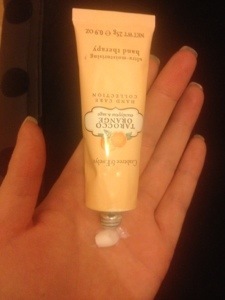 I found the cream a bit strong for my skin type and had a little irritation over my cheekbones. I would perhaps only use the cream on occasions I felt my skin needed a treat. 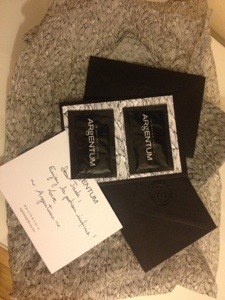 I passed on my remaining samples to my mum and watched her amazement as she felt her skin lightly tighten. I think this product it perfect for someone with a few more laughter lines than myself and could see a difference in my mums skins after a few uses. 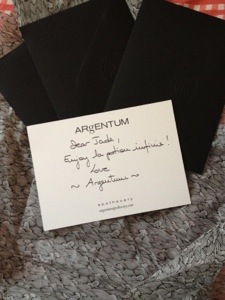 With ingredients including silver it is no surprise that Argentum is situated at the higher end of the beauty market £147.00 (70ml) Here or if you want to try a little before you buy you can get a sample size here despite the high price tag I would have no hesitation in purchasing if my skin was more mature. Such a generous sample size. 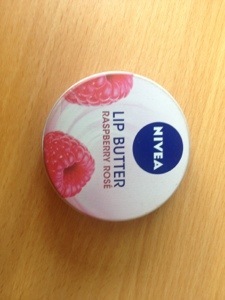 What they say: NIVEA Lip Butter contains shea butter and almond oil. It melts into lips leaving them feeling soft, smoth and nourished. The long lasting formula helps to keep lips moisturised and healthy looking all day long. What we say: We love this little tin. Packed full of moisture and smells devine. We all now carry this as a handbag essential. Yes there are more luxurios lip products but this does what it says for the bargin price of around £2.00. Nivea keeping up its name as the leading brand in budget beauty. 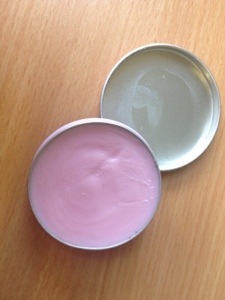 The lip butter retails for around £2.00 per tin and can be puchased in a range of places including Boots and Superdrug (buy online at superdrug for £1.49). What we say: The 18 different uses include some which I would never dream of trying out, never mind inflict on willing volunteers, soap toothpaste anyone?… Thought not. There are a couple of gems to try out. I used the soap as a shaving lotion and loved it, no irritation like I can often get from other shaving aids and it left my skin silky smooth and glowing. We tried the baby mild non scented soap but they do offer a range of fragranced soaps . The beauty of this product being unscented means you can add your own favourite essential oil and taylor to you preferences. In all honesty the girls seemed uninspired when I pulled this bottle out the bag, it looks plain and simple and essentially it is. The uninspired faces turned to horror when I explained some of the different uses: washing clothes, washing mouth, washing body, and even as a wash for intimate parts (this is no longer recommended by the company but was an original use of the soap) nope still no enthusiasm shown. That was until I pulled the bunny out the hat tah dah! Use it as a body scrub, eyes light up and smiles on faces as I explained you could add your choice of scent and then add your choice of scrub, coffee to banish cellulite, sugar or salt to create a more thorough scrub. Teatree essential oil for invigorating, i could go on and on with combinations. Taking DIY spa to a whole new level! Due to time we have yet to try the scrubs but I couldn’t help sharing our little discovery. I will report back with results when I have them. 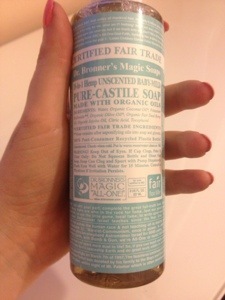 Oh I almost forgot the most important part, the soap retails from £1.99 here. We would all buy it again due to the bargain price and recommend it to friends for a fun experiment. 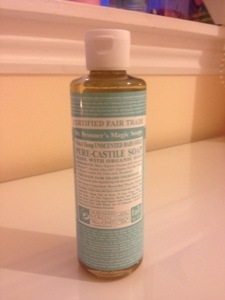 Perfect for a travel essential as it can be used as travel clothing wash, body wash, shampoo etc. 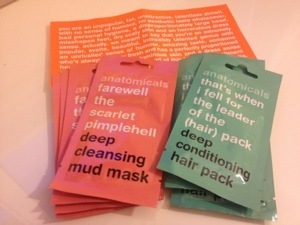 Anatomicals Mud mask and Hair Pack – Part of my spa at home reviews. What they Say: This tounge in cheek brand offers a full range of beauty products. Fairwell my scarlet pimperhell Deep Clensing mud mask – Is perfect for a weekly treat. This deep action treatment purifys skin, boosts circulation and cleanse pores. Leaving skin feeling refreshed, smooth and glowing. Thats when I fell for the Leader of the (Hair) Pack Deep conditioning Hair Pack – This deep Conditioning Hair treatment gives you glossy looking hair. Developed to leave hair feeling shiny, glossy and healthy again. What we say: With catchy names and fun slogans the Anatomical products are great for a girls night in. The face mask works quickly and leaves skin feeling soft. Its great fun pretending to be shrek or a swamp monster (no maybe just me). The hair mask is thin in consitensy but still delivers smooth managable hair. The products are budget range and a very good price. We would absolutely buy these again for a fun night in. 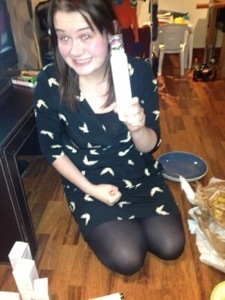 Some of the girls recieved a rose scented shower get by anatomicals in their Glossy Boxes and rate it very high. With the brand tag line ‘we only want you for your body’ being possibly the only time you will be thankful for the sentiment. A range of anatomical goodies are avalible to buy on ASOS here. Also avalible in a range of supermarkets, selfridges and superdrugs. The masks retail for around £4.99 for a pack of 5.